Here at Cockermouth Leisure Centre we have a superb gym featuring 39 stations of Technogym equipment. With membership for less than £31 a month with contract, what are you waiting for? We have a full range of cardiovascular, resistance and free weights. 8 pieces are the latest Excite Unity cardio equipment with tablet like navigation, personalised content including apps, website and more. We are also home to 3 very popular Watt bikes! With full air conditioning and audio visual equipment you can be assured of a comfortable workout with us! We have a brilliant 25m pool which offers a wide range of sessions throughout the day and evening for both adults and children. Whatever your ability in the water we have something for everybody to enjoy. Sessions on offer include adult swimming, family swims, over 50’s, Aqua Fit, Parent & Tots and inflatable fun sessions and much more! Hundreds of children and adults learn to swim with us each week too. One of our most popular classes is Group Cycle, with many sessions a week taking place in our superb studio. Our Group Cycle are available as part of our membership package or alternatively you can pay as you play. As a member you have the benefit of being able to book classes 6 days in advance, non members can book 5 days in advance. 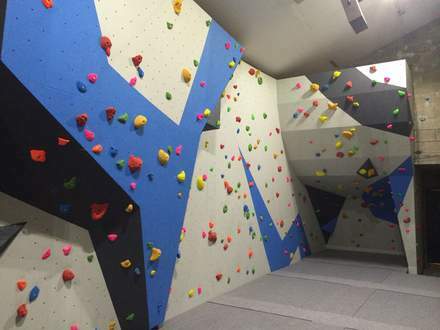 Why not try something a little bit different and have a go at Climbing? Our wall is suitable for all abilities and is available to use on a casual basis or through a season ticket. Please note, no under 16’s are allowed to use the wall unsupervised. 16 & 17 year olds require parental consent. Our studio caters for up to 30 people and is home to over 40 classes a week. Staying motivated can be a challenge, but with a wide variety of fitness classes that we we offer, you'll find the perfect way to keep active. Our classes include: BodyPump, BodyCombat, Group Cycle and much more! All of our classes are suitable for people of any level and abilities. Our hall can host a wide range of activities including football, basketball, badminton, fitness classes and much more. This is also the home of our superb junior courses which include trampolining, football and gymnastics.